Waffles hold such a place in my heart. I made these with my mom on the last day of winter break, the last day of denying the existence of the upcoming quarter, and the last day of languid conversations and peaceful television-watching. 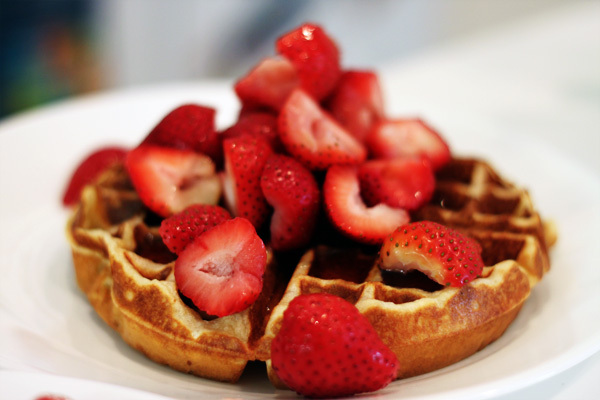 I hadn’t made them in a long time, so the crunch of the waffle, perfectly paired with strawberries was delightful. Though this breakfast was only a weekend ago, now that I am immersed in my schoolwork, these pictures feel like they came from a faraway dream. It’s a dream that I’m yearning to revisit. It’s a dream of home.